Bespoke Lampshades . . . its what we do ! 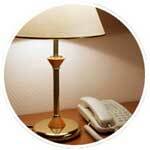 Imperial lighting have been manufacturing quality bespoke lamp shades for well over 50 years. Widely recognised as one of the leading bespoke lamp shade manufacturers we produce both modern and traditional lamp shades for both residential and trade customers throughout the UK online and from our showroom in Torquay. 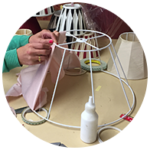 Start building your bespoke lampshade online with our shade builder below, or contact us to discuss your bespoke lampshade in more detail. We can manufacture bespoke lamp shades to almost any size or design from simple table lamp shades through to stunning extra large feature lampshades. Combining our extensive swatch with the ability to digitally print any design onto the inside or outside of our bespoke shades, the options are literally endless ! In addition to commercial bespoke lampshades we are happy to undertake individual orders for our residential customers, from simple bespoke table drum lamp shades to large and extra large bespoke drum lamp shades, in fact any modern bespoke lamp shade you could imagine. 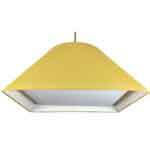 If you are feeling creative, Imperial Lighting offer an online facility to build your own bespoke modern lampshade. 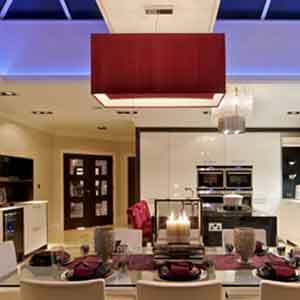 Over the years we have forged strong working relationships with various trade customers such as Interior Designers, Architects, Contract Furnishes, Shop Fitters and of course within the Hospitality Industry. 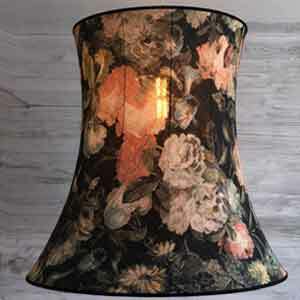 Our can do approach to bespoke lamp shades has gained us a solid reputation as the leading bespoke lamp shade manufacture with the UK which has seen us work on a number of high profile projects supply bespoke lamp shades in all shapes and sizes. 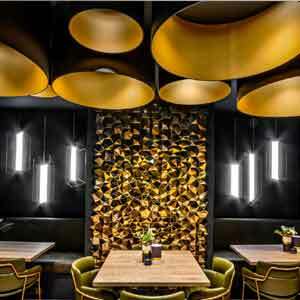 In addition to supplying modern and traditional bespoke lamp shades we also offer bespoke light fittings such as bespoke metal pendants, bespoke wall lights and bespoke feature lights. 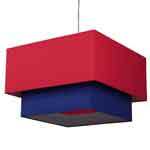 Examples of some recent bespoke lamp shade projects can be found below. Please visit our trade area for more information on our bespoke lamp shade service,or contact us to discuss your ideas in person. 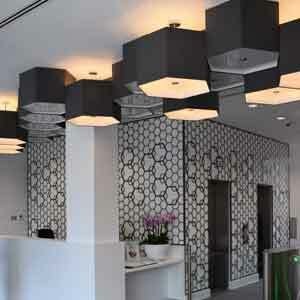 These bespoke lampshade monsters were supplied as part of RBS and Natwest's on going branch re-fit. 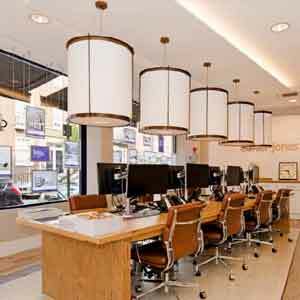 Working directly with RBS in house design team we have now supplied over 600 branches with these epic 2m wide bespoke lamp shades that take centre space inside the branch. The welcome section of this bespoke lamp shades is a 1500mm dia digital printed halo. 265 bespoke equilateral triangle lamp shades measuring 1500mm diameter come to life when the bespoke integrated LED light system is switched on, creating a truly unique effect that has received extremity positive feed back form our client and Plexal themselves. Working we Jack Morton Worldwide we have now supplied bespoke lamp shades for a number of Ericsson and Nokia stands at the Mobile World Congress. 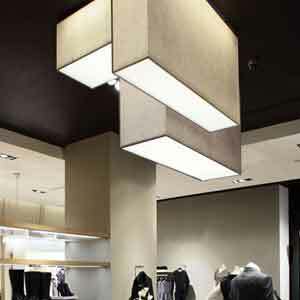 These bespoke lamp shades have ranged from extra large digital printed rectangles to huge 2 m tall columns. 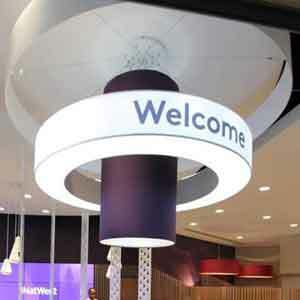 These bespoke drum lampshades were supplied across the RBS branch re-fit. Bespoke lampshades made in Bute Tweed (of course) with contrasting lining and bespoke digital welcome shades. These bespoke drum shades were handmade in the clients stunning gold hand woven lace and black silk and take pride of place in various airports, departments stores across Europe and South Africa. Eurostars Business Lounge at Gare du Nord was designed by Philippe Starck. When the shades needed to be updated Imperial Lighting were the obvious choice to redesign and install new bespoke lampshades in keeping with the design brief. We have been supplying bespoke lamp shades to Celtic Manor for a number of years and were chosen to supply a stunning multi toned bespoke fabric drum shade to each bedroom during there recent multi million pound re-fit. 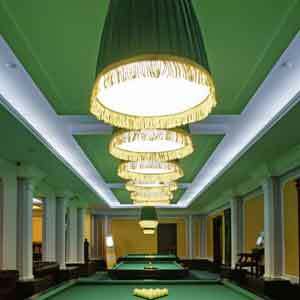 Working to tight dead lines we supplied a large quantity of bespoke lamp shades over this rolling project. 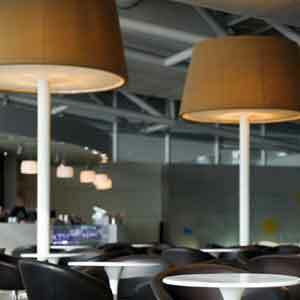 50 black 1200mm dia bespoke lamp shades were used at Prestige Ticketing London Olympics Marquette. 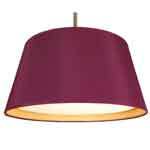 Sometimes with bespoke lampshades less is more ! 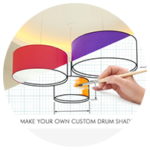 The most popular bespoke lamp shades we manufacturer are drum lamp shades and extra large drum lamp shades which are a cost effective way of filling large spaces. All of our bespoke drum and extra large bespoke drum lamp shades are individually handmade to your exact specification, they can be made in cotton, linen taffeta, silk, parchment or even your own fabric and supplied with or without a diffuser. With the ability to replicate most styles of lamp shade we can offer replacement bespoke lamp shades for ones that become damaged or worn, which can be a lot more cost effective than replacing the entire light fitting. We also offer a wide selection of suspension options for your bespoke lamp shade from a simple single pendant to bespoke multi light suspensions for increased light output. In addition to bespoke drum lamp shades we also offer squares, rectangles, ovals and much more, these bespoke lamp shades can be made to hang or be used on table and floor lamps. 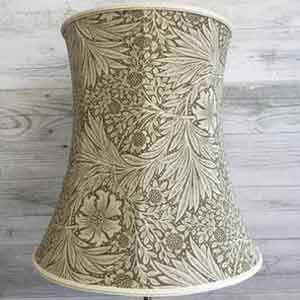 Our stunning range of bespoke traditional lampshades are individually handmade to order. We offer a huge range of stocked fabrics and trims for your bespoke lampshade to be made in, alternatively why not supply your own material for a truly one off bespoke lampshade. Our range of bespoke lampshades come in all shapes and sizes from bespoke candle shades through to table and floor lamps and of course bespoke pendant lampshades. 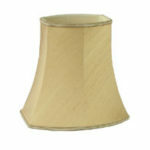 Bespoke candle lamp shades or bespoke clip on lamp shades are also a popular style of bespoke lamp shade that we produce. 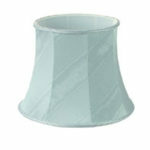 Not all candle shades have the same clip fitting which is why our bespoke candle shades are so popular. Our bespoke candle lamp shades can be made to replicate most clip fittings which insures a perfect fit when replacing your bespoke lamp shade. Our bespoke candle shades are hand made to your exact requirements, we produce bespoke shades to any size shape and style. Examples of some of our most popular bespoke candle lamp shades can be found below, all of the bespoke shade options can be tailored to suit.